Few things compare to the look, feel and—yes, we’re going to say it—the smell of a new bus. Fortunately fellow bus admirers and us, we have 20 brand-new Compressed Natural Gas (CNG) buses arriving by the end of 2019. In fact, our first new addition arrived this month. Here at The Rapid, we’ve been working on transitioning our fleet to CNG vehicles. 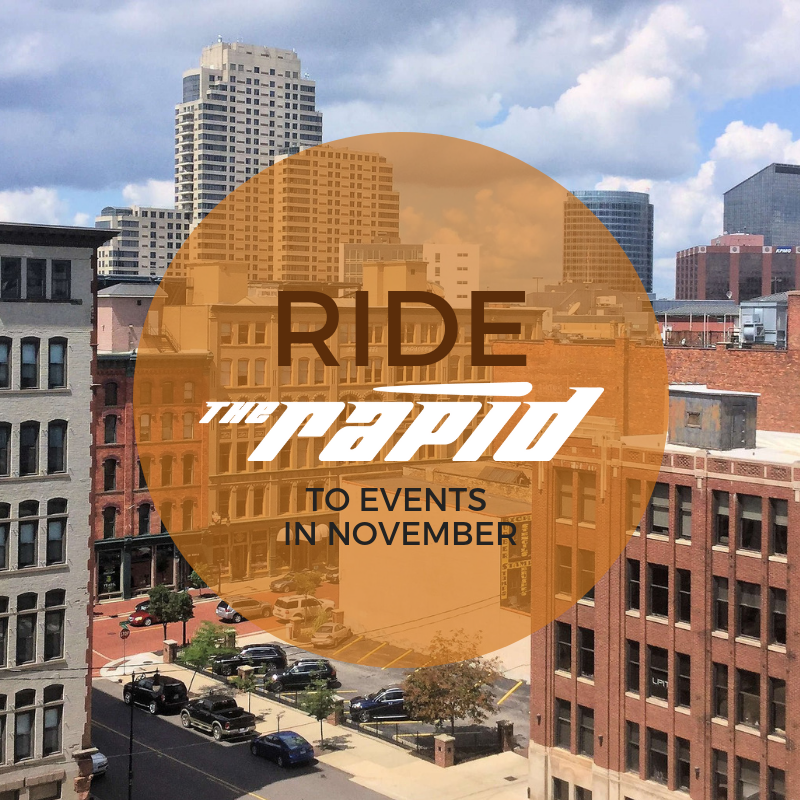 In 2017, we kicked off the transition with an addition of 33 alternative fuel vehicles, including 28 on The Rapid’s regular fixed routes and five for the City of Grand Rapids’ DASH shuttle service operating in Downtown Grand Rapids by The Rapid. The Rapid’s 150-vehicle fleet to include 92 CNG buses by 2021, with plans for full fleet transition in 2028. 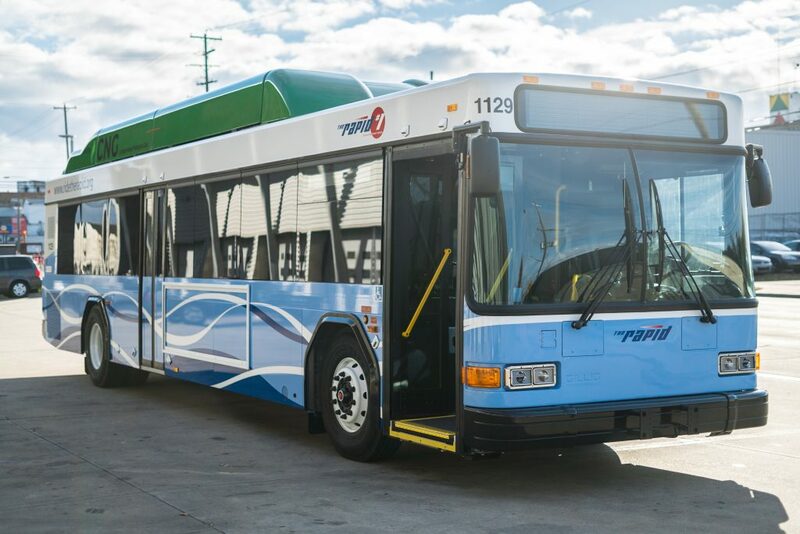 This will make The Rapid the owner of Michigan’s largest system of natural gas-powered buses! Our CNG buses are GILLIG low-floor models. They are made at the GILLIG factory in Livermore, CA and make the cross-country journey to Rapid Operations Center to join our fleet. Our first bus of Fiscal Year 2019 arrived on Friday, Nov. 2, 2018. This is vehicle #1129. — It reduces The Rapid’s greenhouse gas emissions by more than 1 million metric tons over the use of diesel. CNG buses produce up to 20-30 percent fewer emissions than diesel-powered buses. — Poses no threat to land or water if a spill occurs as CNG is nontoxic. — Generates a combined total savings of $4.5 million because the cost of CNG is projected to remain about 60 percent less than diesel. — Ensures access to an American-made fuel source with an abundant 100-year supply, diminishing Greater Grand Rapids’ reliance on foreign oil. Bus 1129 will be hitting the road to pick you up in the near future! Check out our video to learn more about our transition to CNG buses and meet our newest bus. At The Rapid, we hold veterans in the highest regard. We’re proud to honor veterans today and every day. 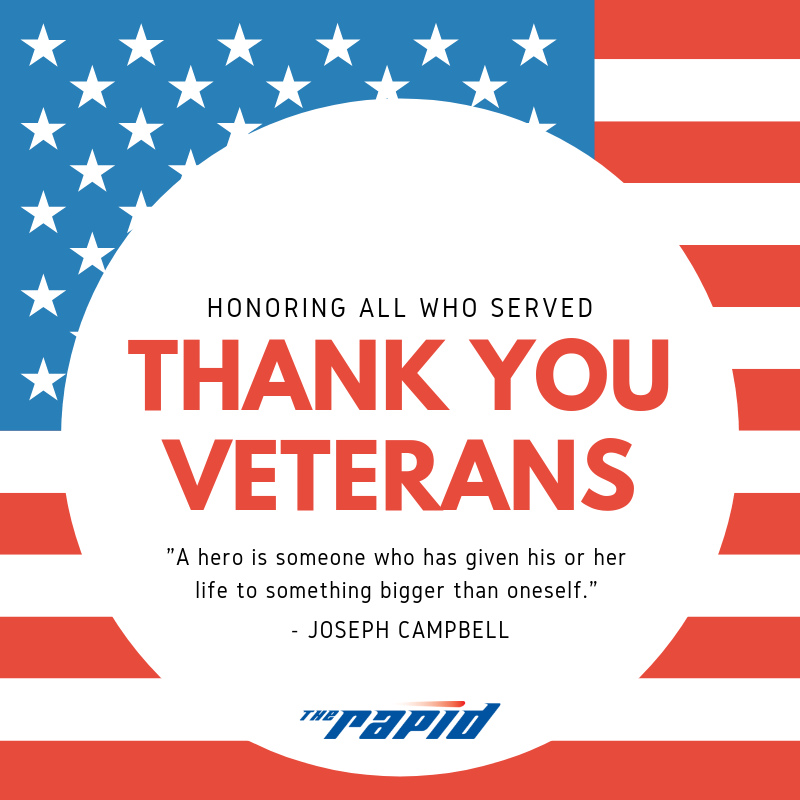 This Veterans Day we wanted to share special thank you to all of the veterans that keep us moving here at The Rapid. We’re fortunate to have employees who have previously and continue to serve our country. We also want to thank all of the veterans in our community for their service. With November comes colder weather and shorter days. However, there’s no reason to go into hibernation! 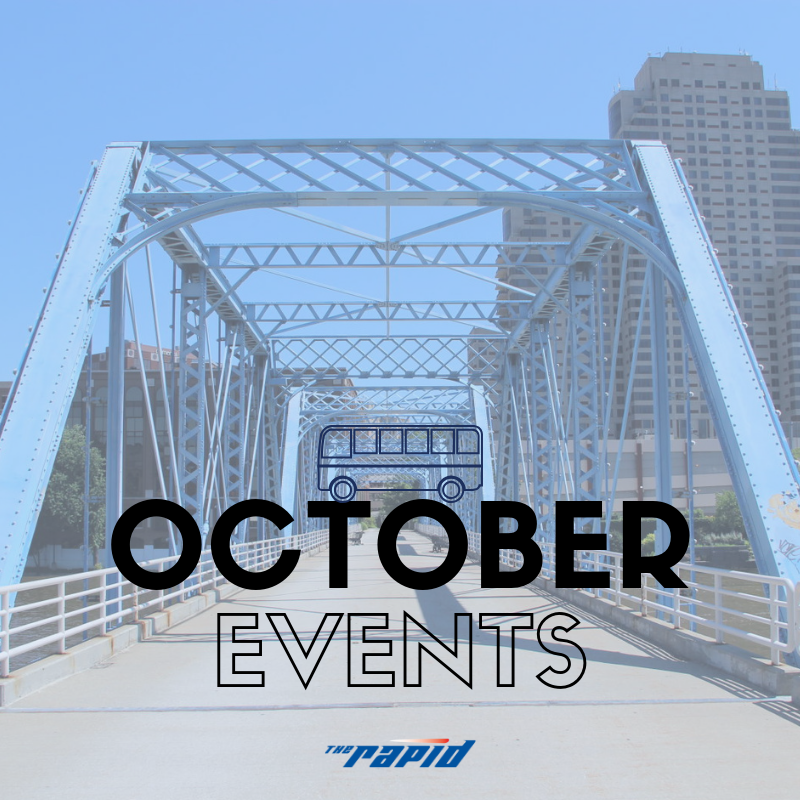 We have a list of fun, transit-friendly events throughout Grand Rapids. Ride the Silver Line to DeVos Performance Hall for this special Grand Rapids Symphony experience on Nov. 2 and Nov. 3. In celebration of the 100th anniversary of the famed Leonard Bernstein’s birth, guest conductor Carl St. Clair, music director of the Pacific Symphony for 28 years, leads the Grand Rapids Symphony in a sampling of Bernstein’s most popular music, most of it composed in the 1950s. American pianist Benjamin Pasternack is a soloist for Bernstein’s Symphony No. 2, “Age of Anxiety,” and American coloratura soprano Celena Shafer takes the stage for highlights from West Side Story, Trouble in Tahiti and Arias and Barcarolles. Purchase your tickets here. From Nov. 7 – Nov. 18, sample a handiwork of the area’s leading bartenders! The third annual Cocktail Week GR is your chance to join in the fun of Michigan’s creative beverage capital. Savor unique flavors while you get in on deals and discounts! View events here. Partake in the fun of Comic-Con right here in Grand Rapids from Nov. 9 – Nov. 11at DeVos Place. There will be a variety of comic, media, YouTube and cosplay guests to meet, as well as a packed exhibit hall and panel. Come dressed to impress! Tickets are available for purchase here. John Ball Zoo is hosting two enchanting weekends of wizarding fun! On Nov. 10 – 11 and Nov. 17 – 18, come to see the zoo magically transform for this interactive event! There will be exhibits, activities, crafts, games, unique entertainment and even specialty foods both muggles and wizards will love. Activities are included in regular admission. Get into the holiday spirit and shop for gifts at the artisan market at the Downtown Market! There will be more than 45 vendors and 20 indoor food vendors. This is a free event from 10:00 a.m. – 5:00 p.m. on Saturday, Nov. 17. Santa is coming to town on Nov. 17 to officially kick off the 2018 holiday season. The theme for this year’s parade will be “Sounds of the Season.” Enjoy local marching bands, carolers, performers and more. The parade begins at 9 a.m. and travels through Downtown Grand Rapids. Ride Route 7 to Blandford Nature Center on Nov. 17 for a fun, historical experience. Blandford’s historical interpreter will be creating a traditional meal like pioneer families from the 1800’s may have prepared. You’ll also get a better understanding of the hard work of daily pioneer life. After preparing the meal, you will eat together in Blandford’s historic Log Cabin. This event is free to members and $3 for non-members. On Nov. 23, your favorite winter pastime is back in season! Rosa Parks Circle Ice Rink will officially be open for the ice skating season. Admission is just $3 for adults and $1 for youth, which includes skate rental. It’s the most spooktacular time of year! Let us be your ride to all of the Halloween fun taking place throughout Grand Rapids. With Halloween landing on a Wednesday this year, there’s a number of exciting and spooky events taking place before and after All Hallows Eve. Leave your car at home (especially if you’re planning on celebrating with Halloween drinks) and let us get you where you need to go. If you and your family love trick-or-treating, there’s a lot more than just visits your neighbors to fill up on candy! Get dressed up and catch a ride to John Ball Zoo for Zoo Goes Boo. Enjoy trick-or-treating, costumes, entertainment, cool decorations, games and animal fun on Oct. 26-28. The Monster Mash at the Kroc Center welcomes costumed visitors for a truck-or-treat occasion around the campus on Oct. 26. Dawn your costume and Trick or Treat at Fulton Street Farmer’s Market on Oct. 27! This event includes pumpkin decorating, cider, donuts and other Halloween goodies. – Faith Lutheran Church Trunk or Treat on Oct. 27. – Creston Neighborhood Trunk or Treat on Oct.
– Trunk or Treat en el Barrio on Oct. 31. Make the most out of Halloween with unique experiences that aren’t just about collecting candy. Creep through an enchanted forest and get an up-close look at animals during hOWLween at Blandford Nature Center on Oct. 25. Enjoy creepy crawly fun for the whole family at the Grand Rapids Ballet School Junior Company’s Spooktacular! Taking place from Oct. 26 – 28. Watch a free showing of Hotel Transylvania 3 for kids age 12 and under at Celebration Cinema from Oct. 26-Nov. 1. Show times vary per cinema location. Enjoy the fall air with the Alger Heights Halloween 5K/10K Run and Walk & Kids Fun Run. This annual family-friendly takes place on Oct. 27. If you want to partake in a bit of fright, we have a few ideas for you. Wealthy Theatre celebrates the season with a Thriller! Chiller! Film Festival of spine-tingling movies, October 23-27, plus two showings of the Rocky Horror Picture Show on October 30. Give an escape room a try! Locked 460 Escape Rooms has some fun, creepy escape room experiences for those who are brave enough to put themselves to the test. Get a costume and get your groove on! There’s no shortage of Halloween parties to add to your calendar. Make an appearance at the Halloween Block Party at Garage Bar & Grill on Oct. 27. There will be a costume contest, outdoor beer tent, DJ and more. Looking for a classy party? Don’t miss the Masquerade Ball at the Ambrosia Theater on Oct. 27. Dawn your costume and experience amazing circus performers, aerial artists and more while dancing the night away. Monster’s Ball 2018 at 20 Monroe Live features Grand Rapids’ hottest DJs plus stilt walkers, aerialists, acrobats, illusionists and other entertainers on Oct. 27. The JW Marriott hosts Just Wicked 2018 – Seven Deadly Sins on Oct. 27. Craft a fabulous costume and join the party! It’s hockey season! The Grand Rapids Griffins hit the ice for their first home game of the 2018-2019 season on Friday, Oct. 12 against the Hershey Bears. Avoid the hassle of parking and travel safely to hockey games with the help of The Rapid. Once again, we’re offering free rides to and from Friday home games at Van Andel Arena. 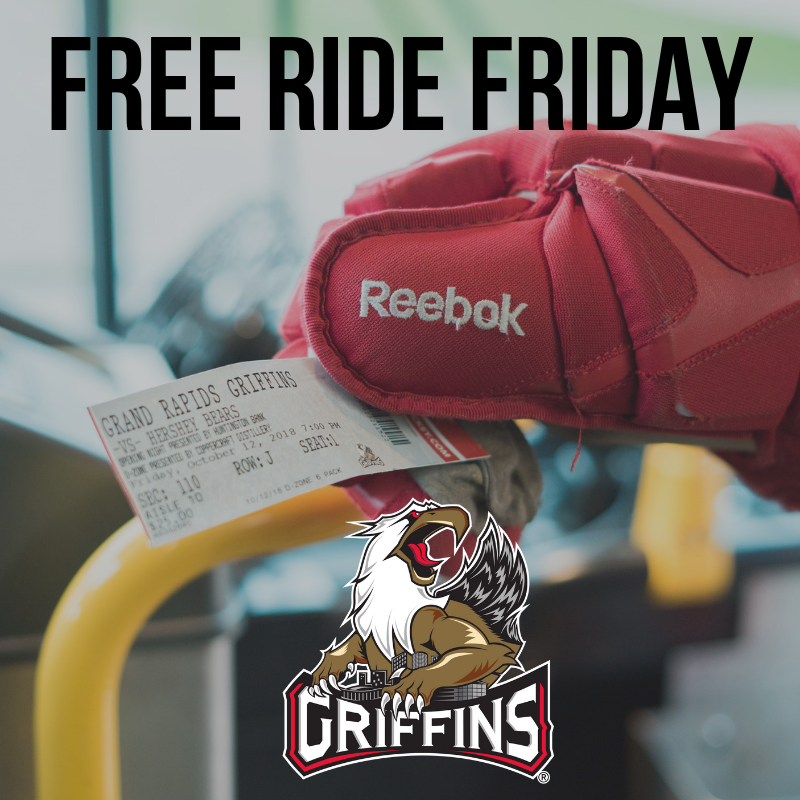 This Free Ride Friday promotion gets you to and from the game at no cost to you. Just show your game ticket (paper or on your mobile device) to your bus operator when boarding. You can plan your trip to Van Andel Arena by visiting ridetherapid.org and using our RapidConnect Trip Planning tools, as well as simply planning your trip on Google Maps (just choose the transit icon). View the full Griffins hockey schedule here. 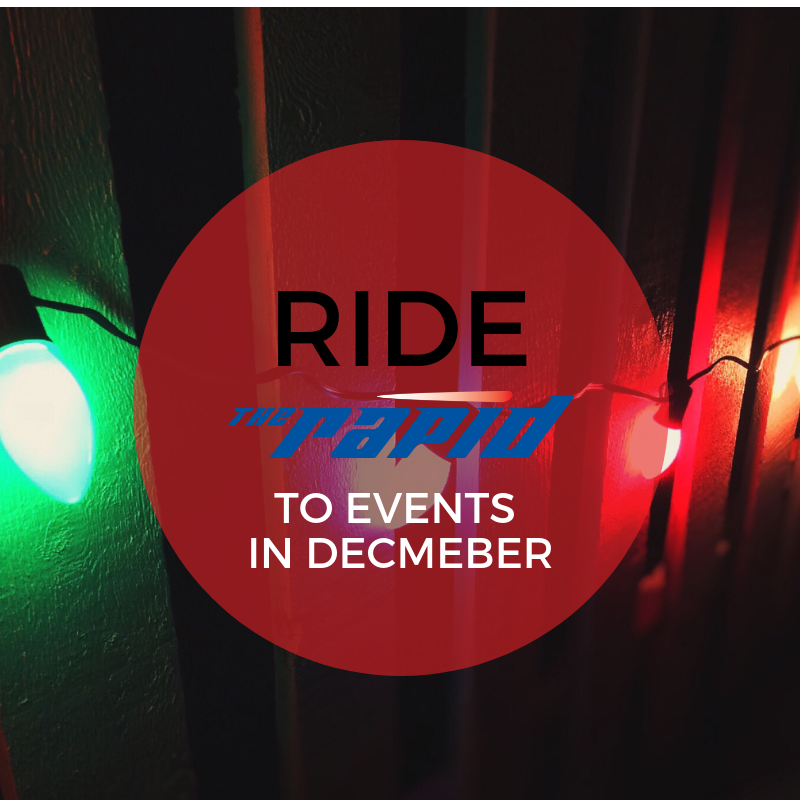 The Rapid provides more than just transportation. It also creates opportunities and enriches lives. 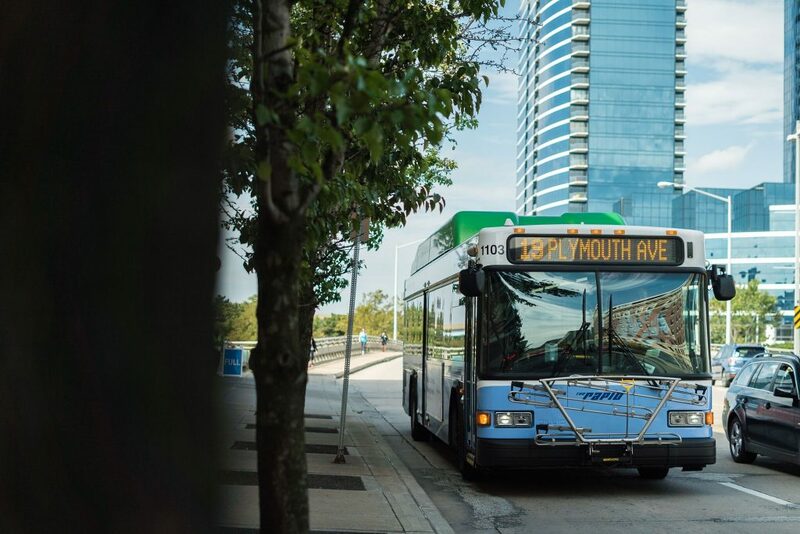 From being a key driver of economic development to reducing traffic congestion and greenhouse gases, The Rapid not only benefits those who ride it but everyone who lives or works within the communities we serve. Can you name the businesses featured in our latest commercial? Whatever you choose to call the transitional season between summer and winter—autumn, fall, crunchy leaf and pumpkin spice latte time—we’re all for celebrating this beautiful time of year. As always, we want to encourage you to explore the Greater Grand Rapids area and check off some important fall to-do’s while you’re at it! Immerse yourself in nature to fully enjoy the changing of the seasons. Blandford Nature Center is the perfect place to enjoy your natural surroundings! Hop on Route 7 to visit Blandford and take a walk on one of their many trails, check out their animals or attend one of their various fall events like the Harvest Festival on Oct. 23. Non-member admission is $3. The craft cider scene is alive and well in Grand Rapids. Enjoy fresh local cider at cideries that are just a bus ride away. 3. Enjoy a bike ride. What’s better than cruising around on a bike trail taking in the fall scenery? 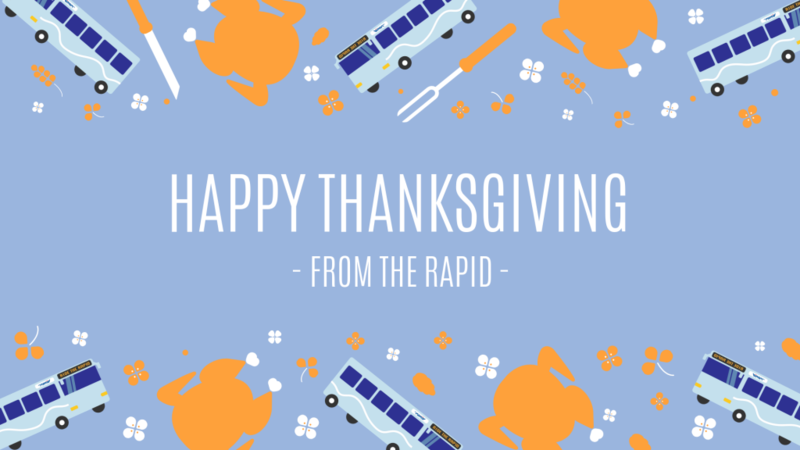 If you’re not up for the full ride to your nearest access to bike trails, catch a ride on The Rapid and bring your bus too! Loading your bike on you’re the rack at the front of the busy is easy. Enjoy the beautiful bike trails at Millennium Park or Riverside Park! You can plan your trip here. For those who love all things spooky, fall is your season! Embark on a tour of Grand Rapids’ most haunted places with Ghost of Grand Rapids. This walking tour is the perfect Halloween treat and a chance to enjoy the gorgeous fall weather while learning about the haunted history of your city. It’s apple season! Ride Route 12 to get within walking distance of Versluis Orchards to pick your own Honeycrisp, Gala and Red Delicious apples. If picking isn’t really your things, you can always purchase fresh, locally grown apples at Fulton Street Farmers Market off of Route 14. 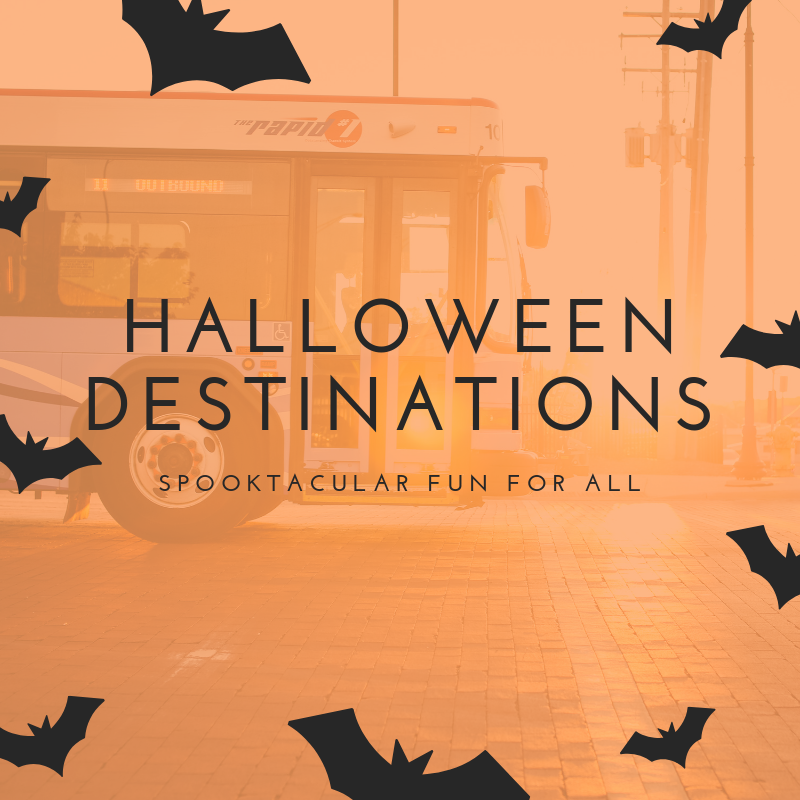 While we can’t allow you to carve a pumpkin on the bus, we can connect you to great places to get the supplies you need. Pick up your pumpkin and carving necessities at Bridge Street Market or Meijer. If you’re up for painting and decorating pumpkins, Garage Bar and Grill is hosting the city’s largest pumpkin painting party! Admission is just $20 and gets you a large pumpkin, small pumpkin, paint, brushes and all other supplies needed. To add to the fun, Garage Bar is serving up delicious cocktails and food specials throughout the event. Cozy candle weather is upon us. What better way to celebrate than pouring your own candle at Wax Poetic Candle Bar. In just 30 minutes, you can create your own uniquely scented candle to take home with you and enjoy all season long. Ride Route 5 to get to Wax Poetic. 8. Enjoy fall beverages and cuisine. Dig into your favorite fall cuisine all season! Restaurants throughout Grand Rapids are sure to pack their menus with delicious seasonal specials. There is also a variety of food and beverage focused events and experience happening during fall to check out. Merchants at the Downtown Market will be participating in a Fall Flavors event on Oct. 26 with features packed with pumpkin, nutmeg, apple cinnamon and other season favorites.